Enjoy this unique-to-Truly Omakase shared menu at Belgravia’s high-end Japanese restaurant, Kouzu. Literally translated at ‘Chef’s Choice’, the Omakase menu is designed by Kouzu founder and former Arts Club Head Chef, Kyoichi Kai. The incredible team of chefs includes the winner of the Global Sushi Challenge 2015, Chef Jia Tian Xia. Just a short walk from Buckingham Palace, and opposite the world famous Goring Hotel, Kouzu opened in November 2014 as a high-end Japanese restaurant. The team is made up of some of the best Japanese chefs in the UK, boasting ex-Nobu, ex-Zuma and ex-Hakkasan team members. 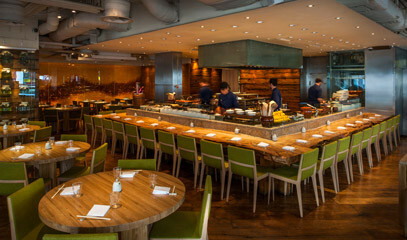 The stellar line-up serves innovative “new stream” sushi in an elegant space. Bold and packed full of flavour, Kyoichi Kai’s take on Japanese food is visually stunning. Using a modern approach to presentation, but with traditional ingredients and methodology, the menu retains an authentic taste of the Far East. The shared Omakase menu offers not only sashimi and sushi, but charcoal grill dishes, tempura and signature dishes using the freshest of ingredients from the highest quality suppliers from the UK and Japan. Upon arrival, you’ll be welcomed with a complimentary aperitif courtesy of the master mixologists behind the bar, who are on hand to conjure up a selection of classic drinks as well as Japanese inspired cocktails. Sat together at the traditional sushi bar on the ground level, you'll enjoy an authentic Japanese dining experience. Watch the master sushi chefs roll, mould, blowtorch and brush your sushi. This experience is only available at dinner. Please note this experience is not suitable for pregnant guests or people with shellfish allergies. Kouzu is open for dinner Monday to Thursday, 6pm to 10.30pm and Friday and Saturday, 6pm to 11pm. Kouzu is closed on Sunday. The earliest and latest seating is at 6pm and 10pm respectively. The menu is subject to seasonal change and availability. Kouzu is suitable for vegetarian, lactose and diary free and pescetarian diners. Please state any other dietary requirements at the time of booking. Service charge (12.5%) is not included; this is left to the guests’ discretion on the day. Note that at least 48 hours’ notice is required for any cancellations or amendments to bookings. This experience is not available on Christmas Eve, Christmas Day, and New Year’s Eve, New Year’s Day or Valentine's Day. All bookings are subject to availability. We recommend booking at least two weeks in advance to guarantee the desired date and time.